Of Jordan, the Lonely Planet has very little to say. Whereas most volumes of LP are comfortably crammed with hearty travel suggestions and captivating information, the Jordan edition is disappointingly scarce. When a carefully constructed list of the top fifteen things to do in a place begins with “Look at the Flowers,” a skeptical eyebrow should be raised. The list slotted Petra at number 11, following such invigorating activities as “Tea and Talk” or the similarly worded “Tea and Tent.” It was as if the authors had sat down over some Jordanian tea and decided that Jordan was so deprived of interesting activity that tourists would become bored to a point where trivial talk about the weather would seem groundbreaking. For us, however, Jordan was a far cry from mundane; rife with adventure and edge-of-your-seat car rides through questionable terrain, this was a country that offered so much more than roadside flowers and palatable tea. I have to begin by declaring my genuine gratitude toward my travel-mates. Very little planning went into this trip on my part – and even that is being generous. The extent of my planning was expressing interest in going, and then paying people back for flights, hotels, and car rentals. The night before we left, Loraine asked about the itinerary. What would we be doing? Where would we be staying? In many ways, I was a bit of a freeloader, hitchhiking my way through Jordan on a caravan of plans contrived by my travel partners. So to reiterate, I am super grateful. 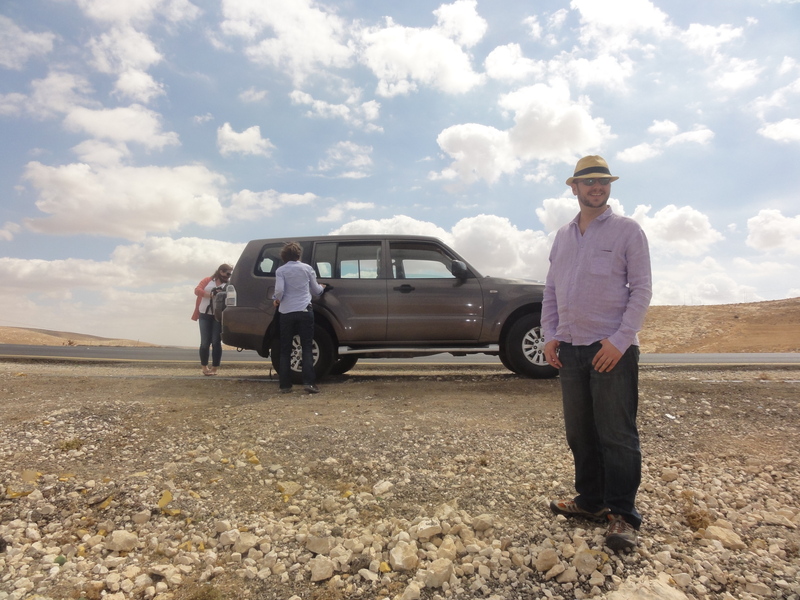 We landed in Amman early on Friday morning, hopped into the rental car, and sped off toward the Dead Sea. We hadn’t been on the road long before we realized that our GPS was navigationally-impaired. We would be happily cruising along a fully-constructed highway when suddenly, a panicked British voice would disrupt the peace. Frantic, it would implore us to abandon our practical route in favor of a pebbly path that rolled a few meters off the road before stopping abruptly at a grassy bluff. Stephen, our helpful copilot, and Matthias, with meticulous German efficiency, would manage to sort out the mishap, but we would all be left wondering whether or not we were on the correct route. The extent of the GPS’s confusion was made clear to us at the end of our trip. Throughout the journey, the GPS had confidently routed us along Kings Highway, a road so marvelous it made the Top 15 list in the LP’s Jordan edition. While a faulty GPS may not seem like a desirable companion, you learn to love it for its adorable obstinacy and its willingness to stand by as it leads you off a cliff or, as we would later discover, through foreboding stretches of mountain. 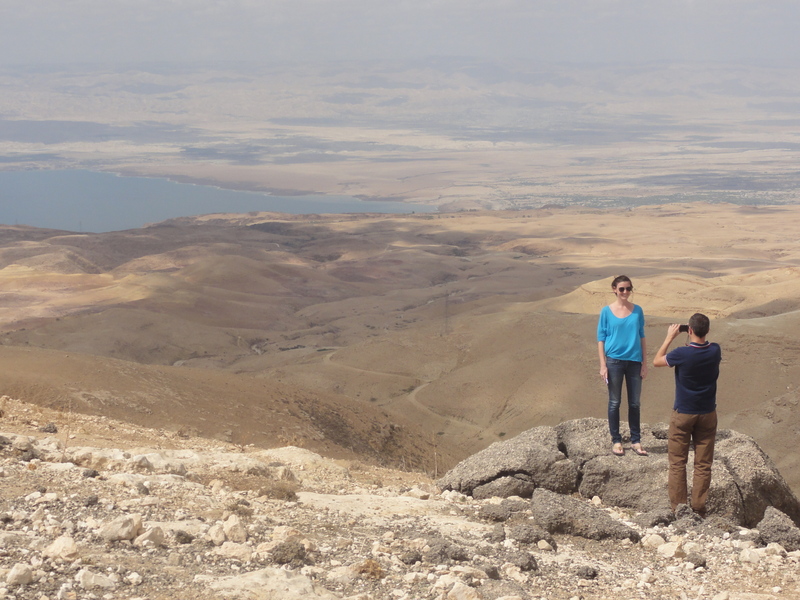 With a team effort – and a stringent monitoring of road signs – we made it to the Dead Sea Panorama, a serpentine road winding downward along cliffsides, which rose in triangular beige contrast to the flat, blue sea below us. As we descended onward to the lowest point on Earth, ears popping occasionally, Amy perused the LP for facts about our destination. The Dead Sea, which is not actually a sea at all but a large lake, has the second highest salinity level next to Lake Asal in Djibouti. In addition to being the lowest place on Earth, it can also be one of the hottest, with temperatures recorded exceeding 120. 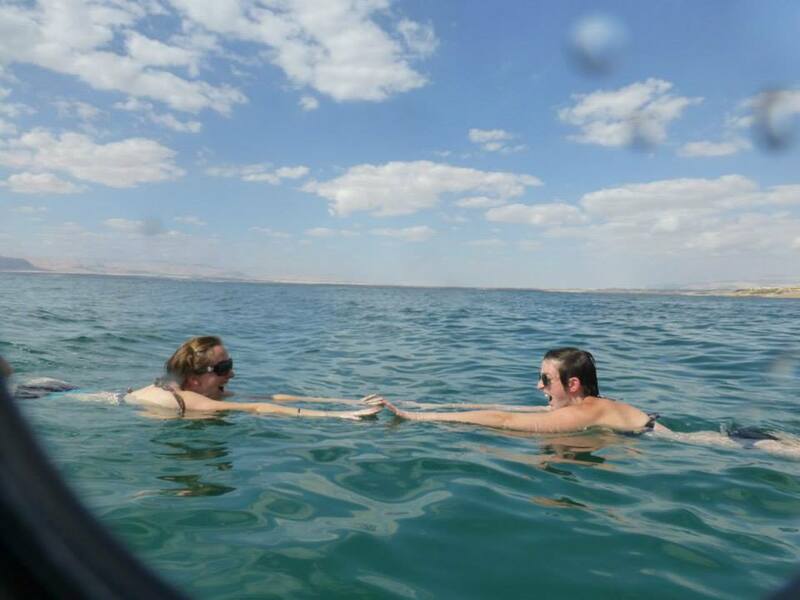 Low UV rays and high oxygen levels are apparently beneficial to your health; in fact, some German health insurance plans factor in Dead Sea trips for psoriasis. Matthias didn’t seem privy to this, but perhaps his lack of psoriasis is to blame. Once we’d parked the car and paid the fee for Oh Beach (the Dead Sea is best accessible through the resorts, which offer easy water entry as opposed to their dodgy, rock-strewn public counterparts), we abandoned the cool cars for the hot and balmy Dead Sea air. And it was hot. Oppressively hot. An informational board at the entrance estimated the water temperature was a steamy 86 degrees Fahrenheit, not much of a respite from the humid air. Nevertheless, we waded in anyway and floated. It’s a strange and enjoyable feeling, floating effortlessly in the water. An attempt at a doggy-paddle or a front stroke is ill-met; the few times I tried, the water carelessly bobbed me over onto my back again. We also excitedly slathered ourselves in mud, as one does at the Dead Sea, aiming for a combination of exfoliation and the unadultered, childlike glee of being dirty. It should be noted here that Jordan is expensive, and its mud is no exception. Contrary to what I believed, you don’t scoop mud off of the seafloor; rather, you pay 3 JD (almost 6 USD) and plunge your hand into a plastic pail to grab clumps of the stuff. Disappointing, but worth it. The afternoon waned as all lethargic afternoons do. 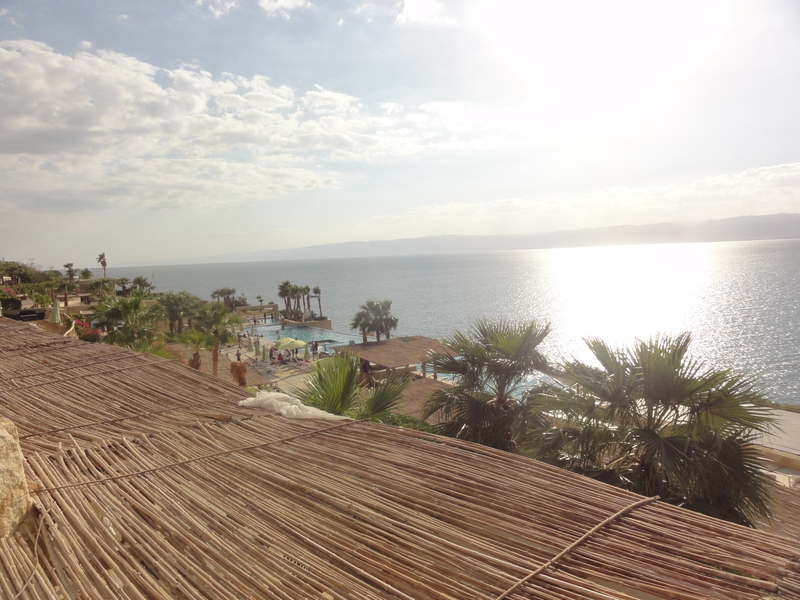 A float in the sea, a dip in the pool (where the heaviness of our bodies in water seemed suddenly strange), an elaborate buffet lunch, a quiet view of a slow sunset over Israel. It was then that we decided it was time to make for Petra, a two-hour drive from the Dead Sea. 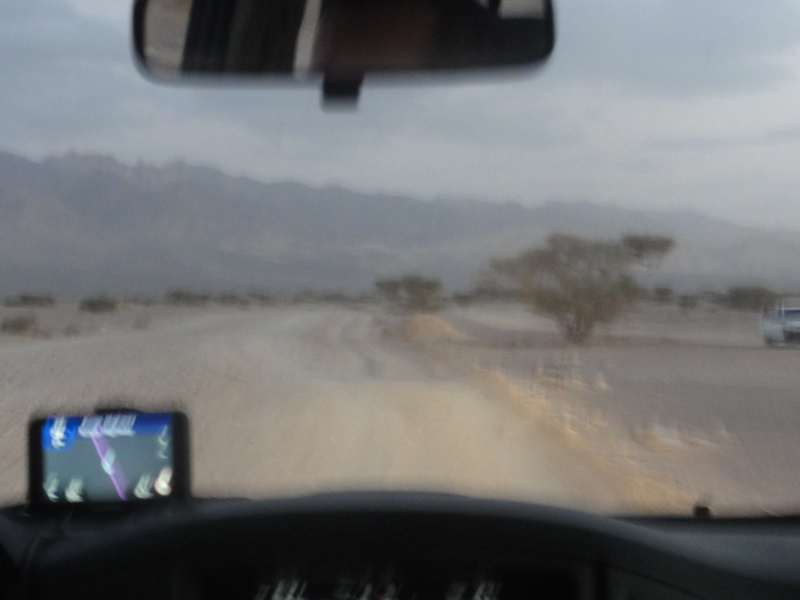 Matthias bravely switched on the GPS and we were off, following a placid, scenic route along the Dead Sea. As we hit the doldrums, Myles, Rhonda, Amy, and I started to doze off in the back, anticipating an uneventful drive to the hotel. Unfortunately, James, the British GPS, had other plans. After skillfully navigating two checkpoints, Matthias obeyed the GPS and turned left off the main road. This seemed fine, until suddenly, the pavement vanished beneath us and a potholed, gravel road appeared in its place. As always, the GPS proudly proclaimed that this, too, was the Kings Highway. However, it no longer seemed plausible that this road was any sort of highway at all, let alone a road. The sun was rapidly setting, and evidence of civilization was speedily disappearing behind us. A quick glance around the backseat revealed that no one was sleeping anymore. Instead, Stephen fumbled for an English-language radio station and the rest of us chattered idly, hoping that the gravel would soon turn back to paved road. It did not. Instead, towering crags rose up around us as the road delivered us into a vast, mountainous wasteland. I suddenly felt grateful to be sandwiched between Amy and Myles in the backseat, with Rhonda behind us. What was especially consoling was the radio signal – until even the radio station took on an eerie tone. As we drove, the songs that played sounded oddly prophetic. Rhonda, Amy, and I were talking about hiking in Humboldt County and in Shenandoah, and the prospect of seeing bears, when suddenly, John Denver came on the radio, crooning about the Shenandoah River. The following two songs echoed the theme of “home.” As the sun sank down and gave way to night, the unmarked road persisting in front of us, a Beck song entitled “Lost Cause” came on. Soon, the station surrendered to a weird, old-time jazz medley. At this point, Matthias was courageously trying to accelerate up the steep, winding road. To our right, vertical drop-offs threatened to claim the car if we turned too close to the edge. Ahead, the road would peak and the downhill portion would be invisible; it was never certain whether the road would veer right or left. On two occasions, we passed a pickup truck filled with wide-eyed Jordanians, gazing at us with perplexed incredulity. It was not reassuring. We’d been off-roading to easy-listening jazz for what seemed like an hour when finally, the bumpy road flattened out and road signs sprung up along the shoulder. Campfires burned at sites along the road and Petra leapt out of the horizon, a thousand glimmering lights. Relief was audible. To our left, towering structures resembling beehives emerged from the ground, dozens of windows carved into rock and lit with tiny orange candles. “What are cave people?” asked Rhonda. The notion of cave people sounded intriguing, but I was still too spooked to appreciate it. By the time we reached out hotel in Petra, we were all wired with a mixture of exhaustion and gratitude at our survival. Craving comfort and a beer, we abandoned the car and hitched a ride in the bed of a pickup that took us to the Movenpick, where 4.50 JD Amstels and bragging rights awaited our arrival.